This issue contains Burn Card a new novel in the Cold Poker Gang series, plus four new short stories, A Look at His Heart: A Marble Grant Story, Wings Out: A Bryant Street Story, Keep Hoping for a New Tomorrow and The Wait. 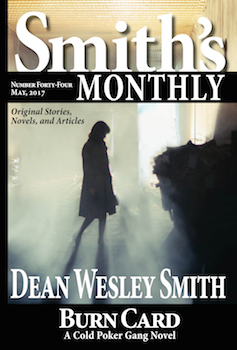 The 44th issue of Smith’s Monthly also includes Heinlein’s Rules: Five Simple Business Rules for Writing: A WMG Writer’s Guide. Burn Card: a Cold Poker Gang novel. Heinlein’s Rules: Five Simple Business Rules for Writing: A WMG Writer’s Guide.